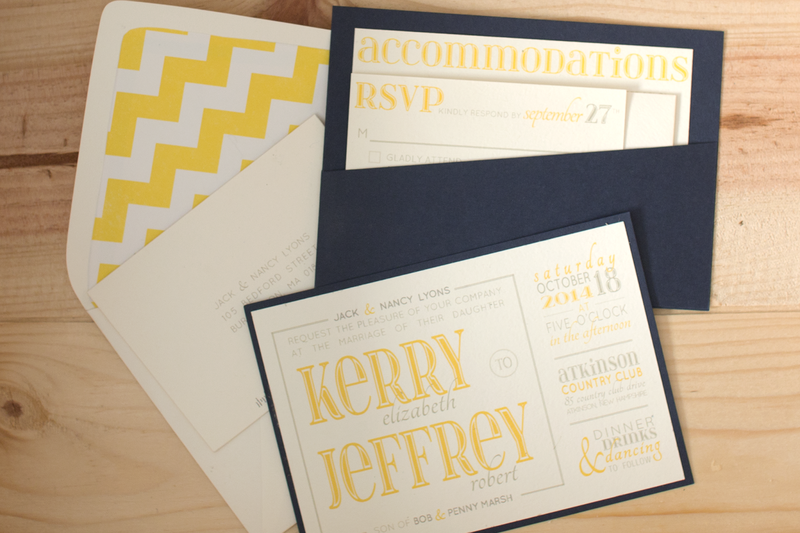 In keeping with the Wedding's color scheme, yellow & navy blue, I decided to only use navy blue in the flat card (border/backer). 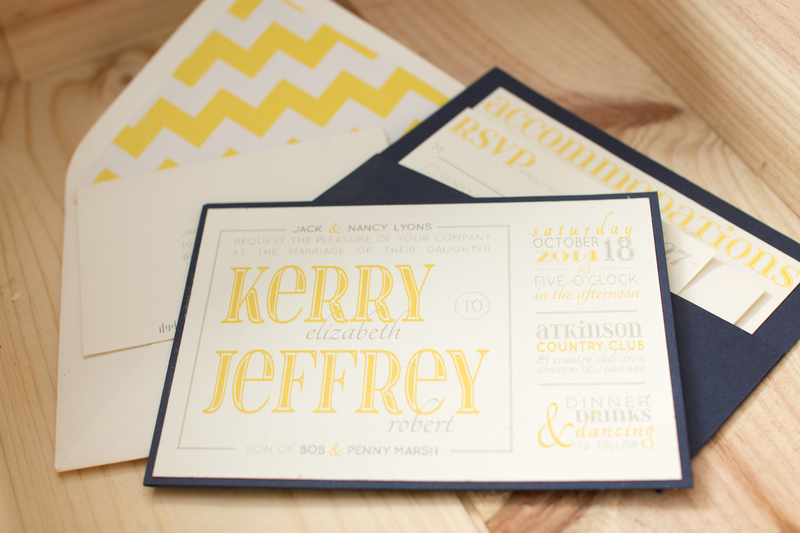 Kerry & Jeff wanted to keep the invitations light and modern, with clean lines. 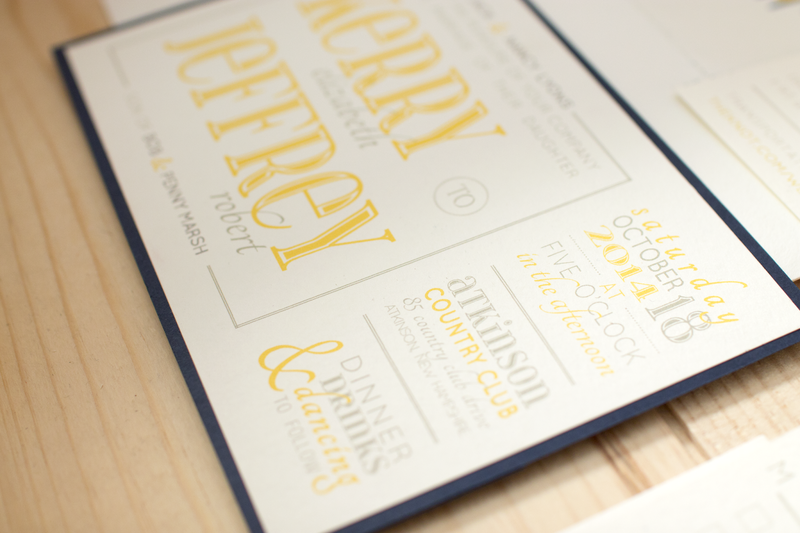 I feared navy text would make the invitations feel too heavy. So instead, I added a warm grey text to balance out the yellow. I incorporated large ampersands and simple grey lines to add a bit of graphic interest. In total, I used 3 different fonts: a cursive, a plain text and a bold, decorative font. 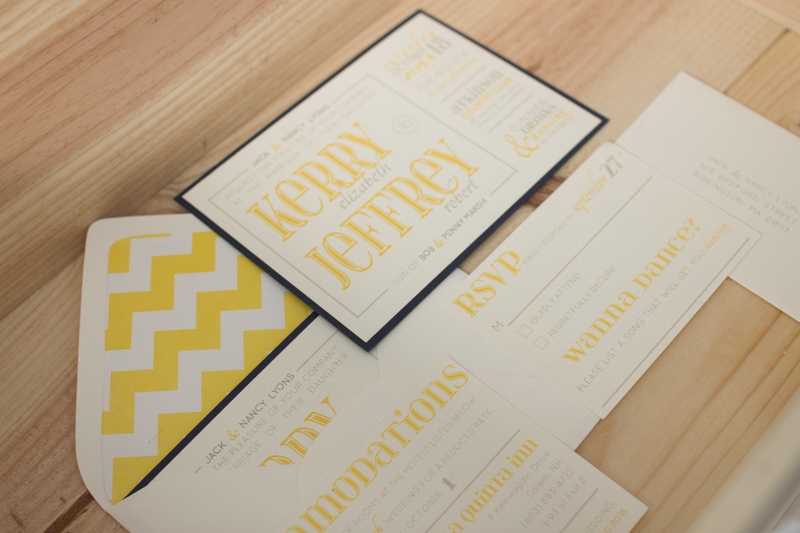 Last winter, Kerry, my mom and I took a 'Wedding Workshop' at the Paper Source in Lynnfield, where we learned how to emboss, line envelopes, custom stamp, etc.. So with our helpful new skills and new tools (envelope liner template and bone folder to make those creases perfect), Kerry and my Mom lined all of the envelopes with yellow and white chevron wrapping paper! (Yes, wrapping paper from T.J.Maxx - a major price saver.) They came out fabulous! 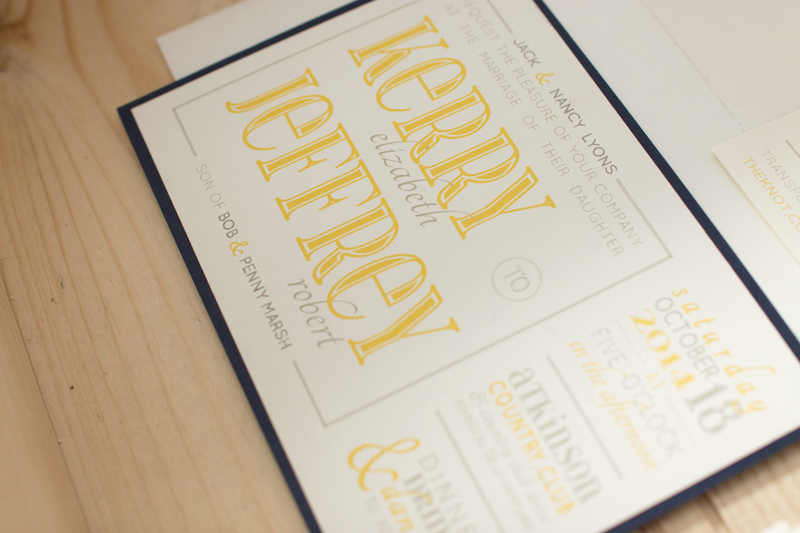 Kerry & Jeff really wanted to keep all information for guest concise and compact. They were all about convenience for their guest. Their main focus was to make sure everyone had a fun, hassle-free experience, from start to finish. (hence the "Wanna Dance?" on the RSVP card.) I created a pocket on the back of the invitation to house the Accommodations card, RSVP card and RSVP envelope, so that guests didn't have to worry about misplacing all the importation information leading up the wedding. The pocket was made from the same navy flat card cut in half on the diagonal so that we could net 2 pockets out of one card. We then used a tape runner (also used to line the envelopes) to attach the "pocket" to the back of invitation's navy flat card. I did all of the printing "in-house" / with my own printer. (I set up the files so that my dad could just hit the print button while Kerry, my mom and I worked on gluing the invitations to the navy flat card.) I was even able to print directly on both the large envelopes (not pictured) and the RSVP envelopes to give the guests an even-more personalized, custom impression. What do you think of the invitations? Let me know in the comments section below.